A new long weekend has arrived this year so we thought we would celebrate with a 10% off SALE! 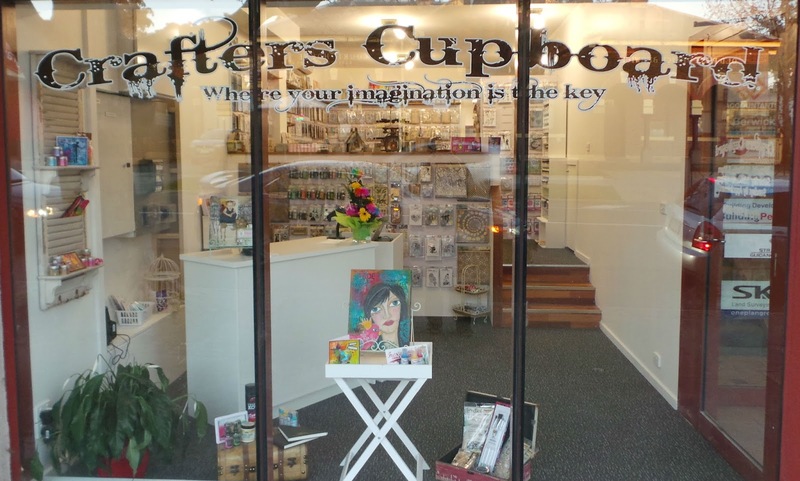 This sale applies in-store and on-line, Yes that's right we are opening the shop so you can come browse and treat yourself to some crafty goodness OR click the link Crafters Cupboard and enter the coupon code FOOTY. 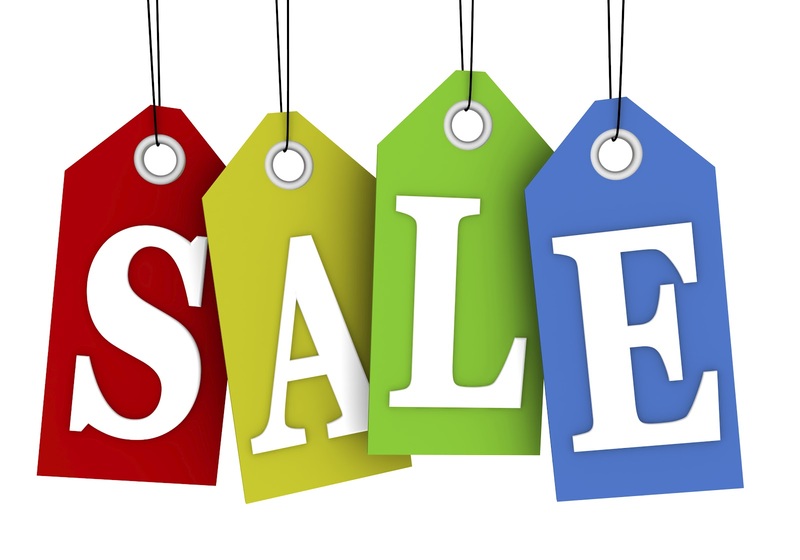 We hope you all enjoy our sale and the long weekend! 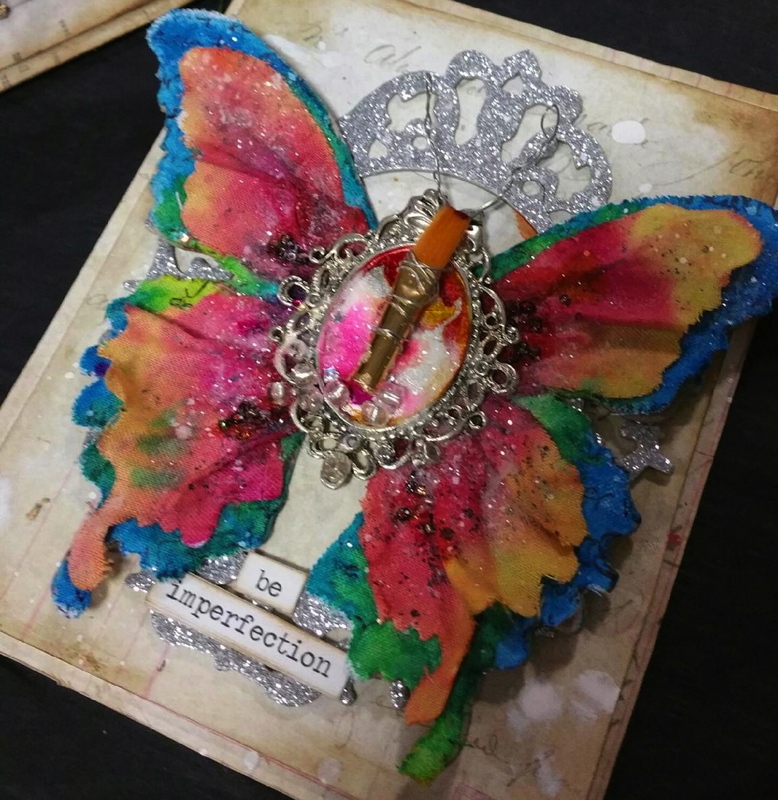 With Demo Day on Saturday you could make a weekend of it and come along to the class on Sunday to create some gorgeous Rainbow Girls with our fabulous tutor Naomi Cox. This all day workshop will have you creating a series of five panels featuring whimsical characters which you can take away to frame for your walls or to give as a gift or gifts. 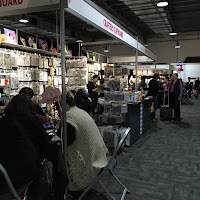 By the end of the day you will have learnt new skills, techniques and ideas that can be incorporated into any of your other craft projects such as art journaling, card making and scrapbooking. A highly recommended day to have some fun and come away with these stunning pieces! A variety of products have been used in the various pages, from Paper Artsy Fresco Chalk paints, Grunge paste, stamping, and more. Renate tried stamping on acetate with Stazon ink as well as lettering through a stencil with grunge paste. She was very pleased with her results. Kylie experimented with using Paper Artsy Grunge paste through a stencil onto acetate. She found it worked really well. Because of the Grunge Paste's fast drying capabilities, she didn't need to risk melting her acetate with the heat gun. Some fussy cutting and she had a fabulous set of wings to go with her face once she had dry brushed colour into it. Jennie used fabulous colours in her piece, highlighting her texture with various products including Silks - those little pots of paint sure do give a great result. So exciting to see the 'extension' here. We had Leanne in the class too - I'll try and catch a shot of her page next month. Looking forward to seeing the finished results when they all come back for their next class. And to finish - some of you will be wondering how the new store is coming along. It's all VERY exciting - here's a few shots of the construction zone - soon to be our wonderful new purpose built classroom. Everyone has been working hard to get the job done and not long to go now. I guess we are teasing when we tell you that this will be the classroom ! We will keep you updated on the opening - not far away at all ! 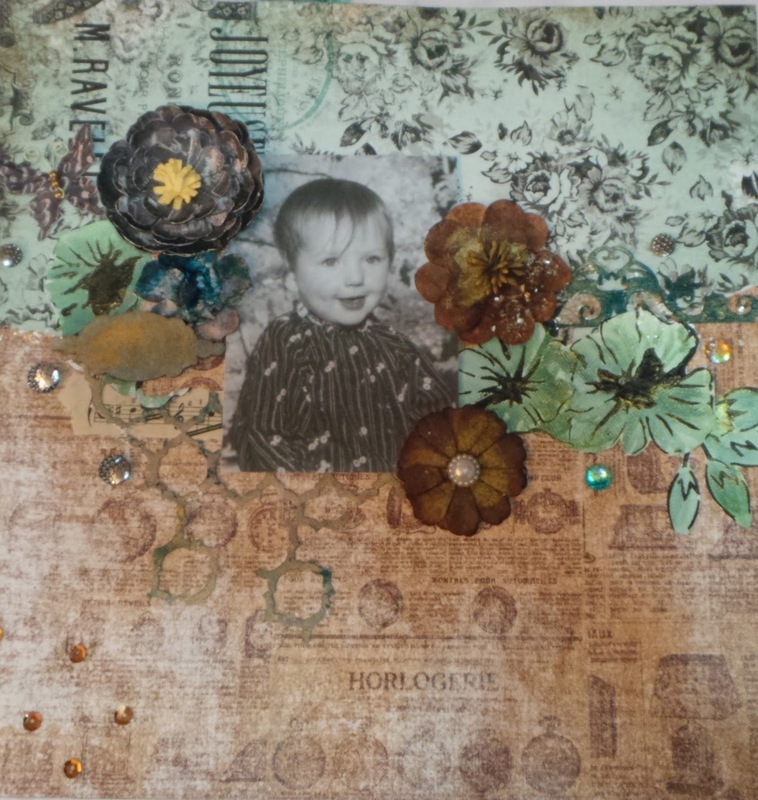 playing in my art journal. This was one of those book boxes that you can purchase from a dissent store. 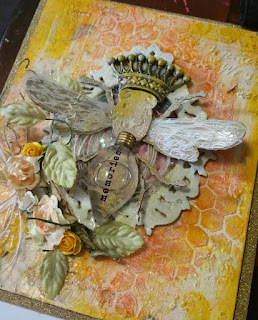 Once the book box had dried, I glued the die pieces down on the front cover of the box with a gel medium, making sure I layered the pieces to create texture and interest. Any excess was sponged off with paper towel and dried off with my heat gun. At this stage, I swapped out the post card picture for another that I thought would work better. and gave the photo a coat of mod podgy to seal it. I then added some micro beads (Finnabair - you can buy them here) to a few bits of the embellishments using a transparent texture paste. and a bit more of Tim Holtz distress sprays, spraying onto my craft mat and using a paint brush to add the extra colours. there is so much more colour in the original piece. and I look forward to showing you my next project soon. For now enjoy what you do and why not try something a little different? The winner of our 'guess what the picture means' draw is ….. 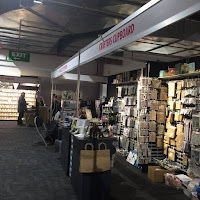 Please email me at jennifer@crafterscupboard.com.au with your contact details including email, mobile, your postal address and we will get your Goodie bag posted out to you this week. 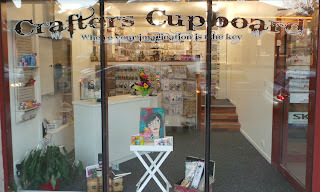 Draw was done by the lovely Irene Prosser from Manor House Creations. Thank you Irene for assisting us with drawing the lucky winner's name and thank you everyone for having a go. What was the correct answer? 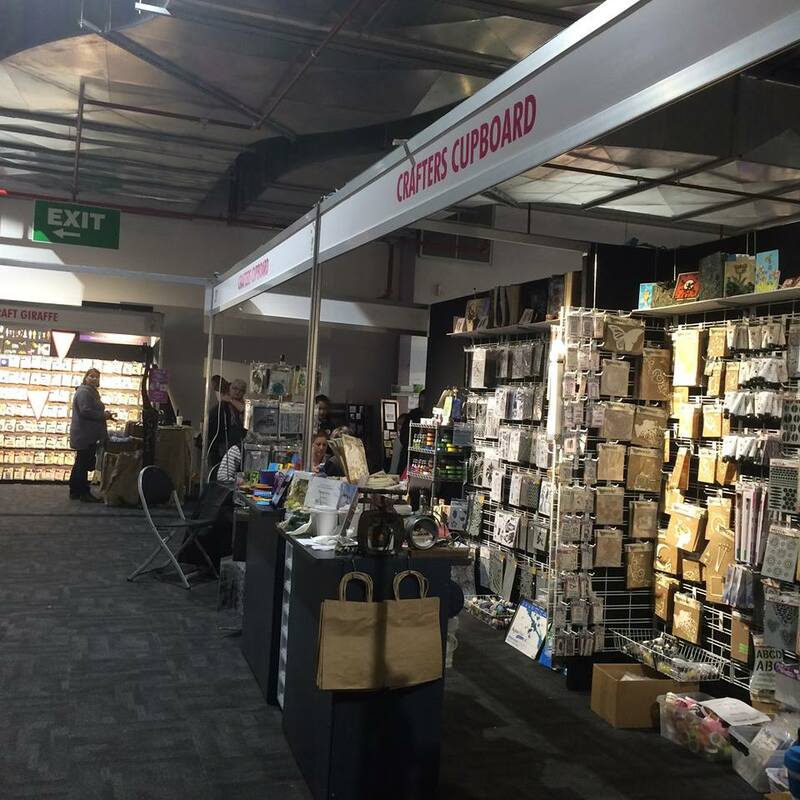 Yes, we are opening a brand new craft store and classroom in Berwick. Opening should be in about 2 weeks - fit out is progressing well. We will keep you in touch with progress !! For those of you who follow our Facebook page, you'll know we have a prize draw tonight. You just need to guess what the photo means and your name will be entered into a 'goodie' bag draw - a stamp, stencil and some other goodies to go with it. Hope you are all having a great day wherever you are ! It's a very wet one here in Melbourne but we are busy so not noticing it too much. Apart from a special project (more about that below) we also have a busy programme of workshops. Next Saturday we have Painting on Fabric. Such a fun thing to do. The first part of the class is learning about using your paints when painting on fabric. 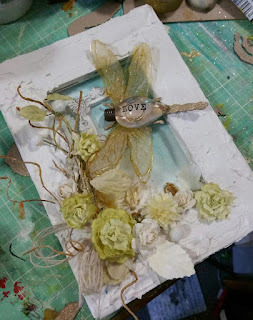 You can use any of the popular craft/art paints around including your Paper Artsy Fresco Chalk paints, Dina Wakley paints, Dylusions paint or whatever else you have in your craft room. Once you've had a bit of practice, it's on to your project for the day - a choice of bag or apron which you take home with you. 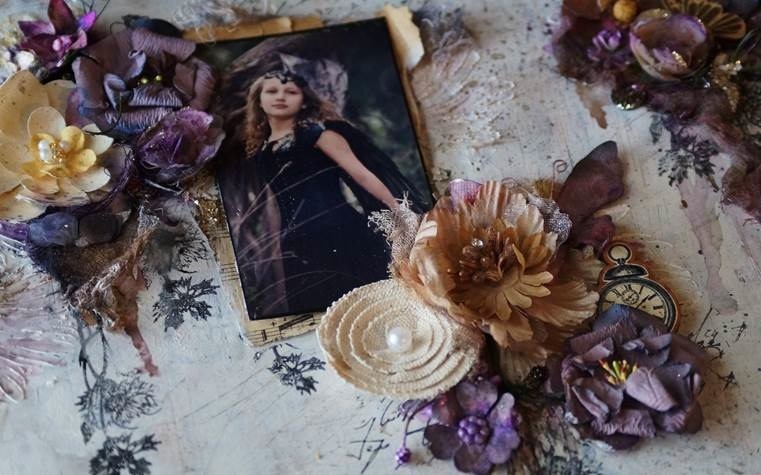 You'll be using paint, stencils and anything else that takes your imagination ! Back soon with updates on the new Paper Artsy release which has come out in the UK this week. Some fabulous new stamps - love them all - and we will have stocks in later this week/early the following week to coincide with the launch of our new 'special project'. 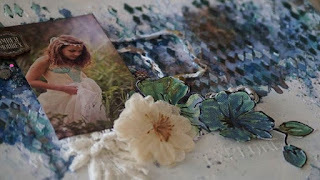 In the meantime, keep guessing and hope to see you at the painting on fabric class next weekend ! So much happening - and not enough time to stop and update you all !! Geraldine Pasinati held one of her amazing 12 x 12 Mixed Media Classes a couple of weeks ago. Everyone went out the door walking on air, so excited with the 3 pieces that they created during the day, along with learning new techniques and having loads of FUN !! Here's a few photos from the day. Think that's about it for now……. We'll be back soon with an update on what the 'mystery' photo is all about ! Most of us would love to be able to draw faces. It looks so hard - but it's not really. All you need to know is how .. and then a bit of practice and voila ! You too can draw whimsical faces. One of the modules on our Art Journaling Basics course is all about drawing faces, and moving on to drawing whimsical faces. So many of our attendees have absolutely loved this workshop, we are running an extra one for anyone who would like to come along and learn just how easy it is to draw a face. Come along for a day and you too will be drawing faces in no time ! We've had fantastic feedback on this workshop, so here's you opportunity to have a go. Pop along to our website and register for the workshop under the classes and workshops tab. Stay tuned for our special news coming out soon ! Just a quick note to remind you all that the wonderful Geraldine Pasinati is with us this coming Saturday conducting another of her fabulous 12 x 12 Mixed Media Workshops. This is an 'all day' event and you will leave with not one but 3 fabulous layouts all completed. We feel very privileged to have Geraldine coming back to do another new workshop. We get such amazing feedback from attendees at her workshops - everyone leaves on a 'high' and so delighted with not only what they have produced in the day but also with new techniques and skills learnt to carry through into their work. If you've not done one of these workshops before, do come and try it - you won't be disappointed and if you've been before, you'll know that coming back again is always worthwhile. There are a few places left - to book, go to our website, choose the Classes/Workshops tab at the top of the page which will take you to the booking page for classes ! If you have any queries, just give us a call on 0478 159 608 & Angus from our Customer Service team will be happy to help you. PS - We have some exciting news to share … soon ! Watch this space ! The wonderful mess of creativity ….. 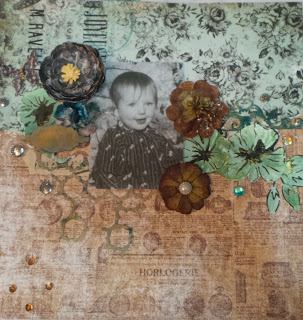 The challenge was to embed photos within the page - definately not in a scrapbooking kind of a way. So - with lots of paint, ink, grunge paste, stencils, magicals, primary elements and all sorts of other bits in between here are some of the almost finished results from Kylee, Leanne, Anne, Renate and Jennie. Well done ladies - awesome results ! If you are thinking of starting Art Journaling and don't quite know where to start, we have a new group starting soon on our basics course over a 6 month time frame. Go along to our website here, click on the Classes and Workshops tab and sign up. We will contact you with the details.